Home Entertainment Here Is the ‘Running Man’ Episode That Kim Ji-won Appeared On! Actress Kim Ji-won became a guest on Running Man in the Episode 297 Special Descendants of the Sun, which aired on May 1, 2016. Other guests in the episode were her co-star in the drama, actor Jin Goo and Cosmic Girls’ Eun-seo. Kim Ji-won acted as First Lieutenant Yoon Myung-ju, an army doctor who is in love with Jin Goo’s character, Sergeant Major Seo Dae-young. Warning: This article contains spoilers of the episode! The episode began with guest introductions. Running Man members cheered happily when Kim Ji-won was introduced. They praised her, saying that Kim Ji-won only became more beautiful. During her guest interview, she was asked to sing one of the commercial jingles which made her rise to stardom. When Kim Ji-won sang the song, the Running Man members were smiling ear to ear, and applauded when she finished. After Cosmic Girls’ Eunseo’s danced, Jin Goo was asked to dance to Red Velvet’s ‘Dumb Dumb’, as his character’s dance in the drama. He sighed at first, and danced with a blank expression, even though his body moved to the beat, which made everyone laugh. While they were at it, Yoo Jae-suk also asked Kim Ji-won to dance. She danced the triple heart combination dance, and finished it with an arrow of love. After that, she made everyone else dance to it, one by one. The first race began before filming, and for the challenge, each member had to solve the given problem and write the answer on the producer’s arm. However, they had to catch the producer, as he ran off after handing them the mission. Ji Seok-jin, Song Ji-hyo, and Kang Gary were each given a loser sticker. The crew then played a video to help the cast for the episode understand what was going to happen during the rest of the show. 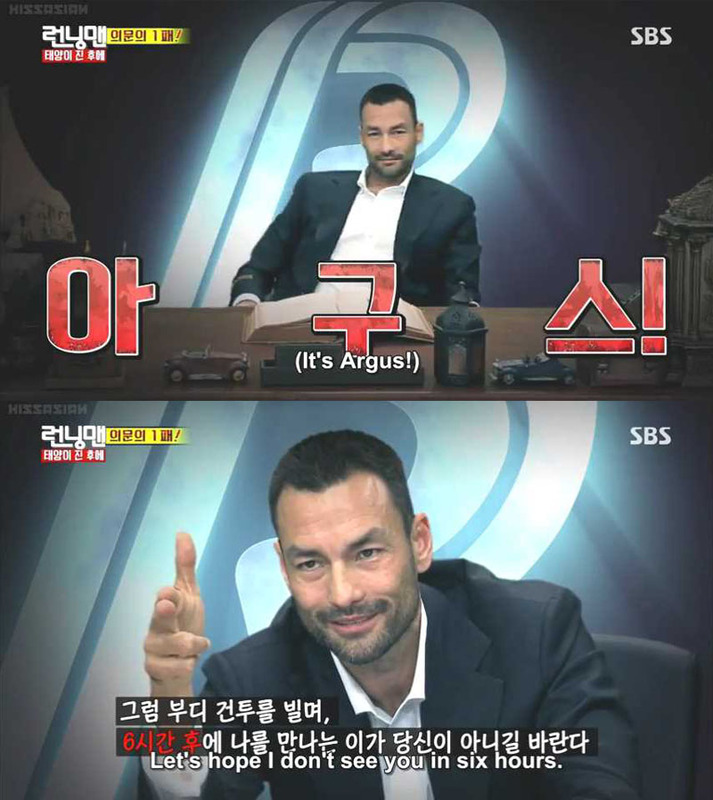 In the video, David Lee McInnis, who acted as David Argus, the main antagonist in the drama, explained that in six hours, the members would meet him and receive a deadly punishment. But if they did better than the Red Sun who was hiding amongst them, they would be able to return home, safely. The Loser’s stickers that several of them had received meant that they were slower than the Red Sun in completing the mission. If the members wanted to survive, they needed to find the Red Sun as soon as possible, and prevent his victory. The next game was a couples game. The playoff game to decide partners was a five-words race. The game followed Kim Ji-won and Jin Goo’s scene in the drama. The male members had to name 5 words with the same letter that the female members mentioned in 5 seconds. Kim Ji-won was the first player, and made the male members all fired up. However, she counted off the seconds at different speeds with each of the guys. She counted quickly for Haha, Kim Jong-kook, Ji Seok-jin, Kang Gary and Lee Kwang-soo’s turns. It turned out that Kim Ji-won wanted to be coupled with Yoo Jae-suk, and counted very slowly for him.